IN 1907, DONALD ROSS WALKED DOWN FROM THE CLUBHOUSE and across the road into untamed lands. Although in close proximity to his early version of No. 2 Course, the terrain was strikingly different. These lands bumped and rolled in a way that would allow the resort to provide an unusually wide variety of playing scenarios. Ultimately, this blend became one of the central elements of the club’s appeal. Although the soil was ideal for design, it was the distances between the knolls and ridges which stirred the young professional. At the time, he could have gotten away with any number of configurations. But, it was increasingly clear this man would not be satisfied until he had taken any task to an optimal level. This was also the time when Ross was in the process of establishing his reputation. You can be entirely sure he knew his efforts on No. 3 would be a critical point on that path. What is now the 2nd hole on Pinehurst No. 3 includes the return of an original bunker and sandscape feature that Donald Ross had originally designed for the hole. Here, the area is seen in its three iterations – past, recent present before the returned features on No. 3, and today. Pinehurst No. 3 was Donald Ross’s first ingenious design. Much of the restoration work is designed to return elements of Ross’s original design characteristics, including sandy native areas and wire grass. Where before players could see mounds or depressions that reflected past design features, now those elements are brought again to the forefront with the sandscape and bunkering. Note the above photo of what is now the second hole of Course 3. The vintage photo is from the 1930s, and one can see how the native area defines the hole. In the middle photo, that area was grassed over, though the original slope of the land remains. Today, though, as the course reopens, the work Kyle Franz did to recover that area returns the hole to its vintage glory. And what you don’t see – the bunker comes into play off the tee from the first hole as well. It’s pure Ross. Two new holes were built – both par-3s – and the course will play to a par 68. In doing so, the two new par-3s are devilish short holes that feature sandscape and water. In addition, where the par-3s were placed allowed designers to rework two other holes, making them more interesting in the process. Tour the course and it quickly becomes readily apparent – Ross-style strategy is evident throughout. Short par-4s could be drivable, but the small turtleback greens and native areas could make a short hole yield a big score in a hurry. Perhaps the player should lay up off the tee instead to a number he or she is more comfortable with into those small greens. Much like No. 2, the player may now need to consider the hole location even from the teebox. The rough bunkering around these small greens are vintage Ross. Ross’ genius was in the ability to envision a seamless run through the uncommon collection of hills and hollows. Long shots, short approaches, uphill, downhill, side hill, the course balanced all these elements with an exceptional sense of adventure. It was on these lands that his talent crossed over from the dormant to the fully awakened. AS WITH ALL COURSES OF THE DAY there have been a number of changes. The housing adjacent to most fairways can lead attentions away from appreciating the brilliance of Ross’s use of the land. In addition, some of the original holes were incorporated into No. 5 Course (where they are still in play). For many years, the course has been greeted with less enthusiasm than the design warrants. Well, the exceptional nature of the course did not escape everyone’s attention. Mr. Crenshaw’s words (which far preceded his association with the club) tell you all you really need to know about No. 3. Even most weekend golfers know there is no greater authority on such matters. An example of how Ross brought so much personality to this course can be found in the contrasts between two back-to-back holes on the inward nine. The uphill 14th is not your standard par-3. In the days of hickory clubs, it played 208 yards to a green placed at the top of a fairly sharp hill. No one but the ace player was expected to reach the green with their drive. But Ross never forgot the shorter player. There is ample room for a tee shot left of the green leaving a short pitch. Like many of golf’s finest holes (such as the 13th of Augusta), it is essentially a “half-par hole”. After this strong challenge, Ross balances the ledger by having the 15th offer a real opportunity for birdie. The unusually wide variety of holes is continued here with terrain that is the opposite of the 14th. The 15th tee shot plays sharply downhill to a wide fairway. The fairway ‘cants’ left to right, adding yet more playing interest. Those attempting to reach the shortish par-5 in two will have to contend with one of the most intriguing bunkers Ross ever did. In modern times the angular gully that crosses the entire fairway has been grassed in. Now it’s back to the sandy, rustic look of earlier days. This will enhance the strategic as well as aesthetic aspects. AFTER EARLY YEARS OF GLORY, with lofty words in the journals and battles among the world’s best (Sarazen, Hagen, etc. ), the course drifted into a kind of obscurity. In some quarters, you’d hear a word or two about its relative merits. But the rest of the 20th Century found it literally and metaphorically on the other side of the tracks. The current era of golf architecture is rooted in an appreciation of the early masterpieces. Considerations of those works have led a number of clubs to return to those earlier versions. In virtually every case, the reestablishment of classical stylings has been greeted with applause. This was certainly the case with No. 2. In fact, the praise for that restorative work was so lavish that the next chapter in this long running saga became entirely clear. The day has arrived when the rest of the Pinehurst courses begin their prodigal return to Ross’s era. 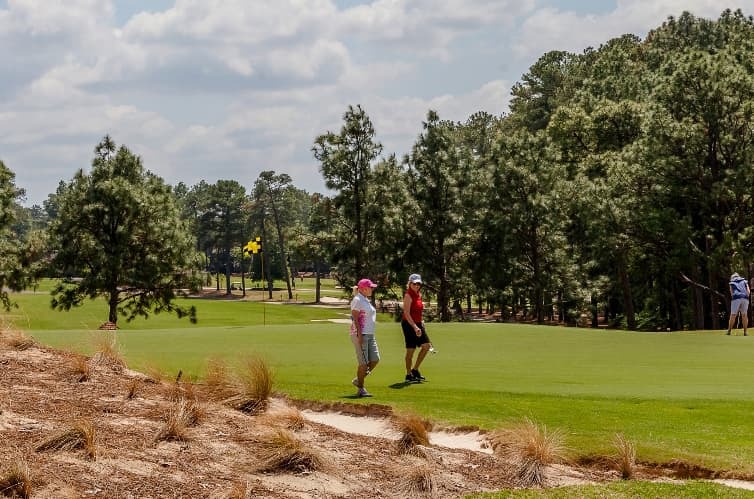 JAMES TUFTS, THE FOUNDER OF PINEHURST had a simple formula for turning his vision into a first tier production: hire the best possible people. That infallible approach is being carried on today. The artisans at work are among the very best in the world. The knowledge and artistry of today’s team are nothing short of brilliant. The resort lived for many years on past glories. But, Payne’s “moment in time” did more than signal a return to greatness. It was the opening page of a new chapter that will be every bit as storied as those days when the giants of history stalked one another on these fairways.